I want this bike badly. Too my bike my bike fund is empty. The story of Witcomb is interesting as Richard Sachs, J.P. Weigle and Chris Chance all worked there. Last edited by Flog00; 01-20-15 at 12:14 PM. At least I would know where to find it when I recover from my Tomii build. It's a very cool bike, and Witcomb has that legendary status with me too, but you don't know who built it. It sort of reminds me of every Masi ad that talks about Confente and Eisentraut; ok, that's nice...do you have any evidence that they built the bike rather than Mike, the foreman's cousin who became a used car salesman a few months later? Tieing some great builders into Witcomb doesn't make it worth what an early sachs/weigle/chance is worth. That thought did cross my mind, and before I would spend that much, I would expect the provenance to be verified. The seller claims that Richard Sachs himself built this bike. I think Richard is on these forums.... maybe he could chime in! Last edited by Flog00; 01-19-15 at 07:42 AM. That is a great bike, but it would be functionally redundant with my Bianchi. I am already at my storage limit with four road bikes. Apparently I try to build all my bikes into the same thing. I spoke to the current owner of the bike from Scott's Cyclery. He said the story that Sachs built the bike is from the original owner, but that it isn't verified. He said it's doubtful that Sach's could remember a specific bike from '75 but that either he or Weigle must have built it. That is a highly ambitious price in any case...and if my memory serves (which it may not), some of the Witcomb usa bikes came in from the UK. It's a cool bike, but there are a lot of cool bikes out there. I'd hold out for the real deal. You're also a lucky bugger if you're in Milan. I legitamately had water come out of my nose on that one. I really like the Witcomb. Neat bike, but not close to my size. Besides, my C&V budget is shot for 2015. This is my size, but I just bought a Trek 720 and I live in a very small place. And I used up my stashes (work, work place 2, girl friend). That seems highly unlikely, but I am not saying I don't believe it. I'd like to know more information though. The two are readily identifiable however as you they always have the sticker. I owned a UK model briefly (not my size or I'd probably still have it) and they all had the same made in the UK decal on them. The craftsmanship of the UK shop is top notch, I wouldn't lick an witcomb out of the shed whatever side of the pond it's from. Interestingly, the Whitcomb UK I had has was basically the same as this. Campy dropouts, one set of eyelets, same lugs AND it had black first gen DA hubs (high flange) laced to 27" hoops and superbe brakes I think. many other parts were missing. It did not have the brazed on plate which I assume is for a pletscher rack. Last edited by cyclotoine; 01-19-15 at 05:11 PM. The Witcomb (there's no H) frames made in London didn't look anything like what we made in East Haddam, and that extends to the decals. How they made them in Deptford and how we did things in Connecticut also had precious little in common. Also, the bicycle made abroad (in Wales) for Witcomb USA was part of a name licensing. Initially the project was about the family commissioning an out-of-work factory in Pwllheli's dying economy to make B level bicycles. That failed. Our boss in Connecticut somehow interceded briefly and two, maybe three containers were shipped to us, and all were sticker-ed up as Witcomb USAs. These were$150 bicycles with steel rims, cottered cranks, and an assortment of crap. one would have to be completely out of all loops to confuse the East Haddam frames we were making with the factory bicycles that we also sold to LBSs back then. I guess from my perspective much of the value of this bike would come from the fact that you built it. 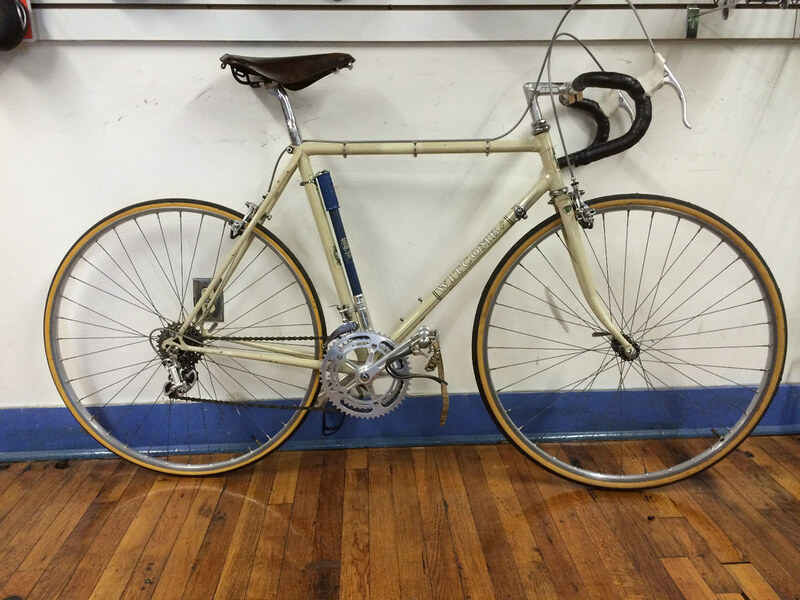 Could this bike have been built by someone other than you or Weigle? Last edited by Flog00; 01-19-15 at 06:11 PM. Peter and I shared assembly duties and it was rare, EXTREMELY rare, that either of us did a frame end to end. He'd do fronts, I would add rears, and the forks were filled in by one of us. Or I would do fronts, he the rears, etc etc. Gary was hired to do prep work and that's when the operation became streamlined. He prepped all the lugs, set up some fixtures, and did a lot of finish work. When it was only the three of us, that's when the system was in its most efficient iteration. I hired Chris later (in 1974 iirc) and we showed him how to bend blades, add contrasting color to lug windows on painted frames, slot stays for dropouts, and other grunt tasks. He never did any serious brazing or effbuilding there. There was one or two other cats along the way, none of them cyclists who would have stayed in the game once the dust settled. That's exactly what I was thinking... We each seem to have an embarrassment of riches. Peter and I shared assembly duties and it was rare, EXTREMELY rare, that either of us did a frame end to end. He'd do fronts, I would add rears, and the forks were filled in by one of us. Or I would do fronts, he the rears, etc etc. Gary was hired to do prep work and that's when the operation became streamlined. He prepped all the lugs, set up some fixtures, and did a lot of finish work. When it was only the three of us, that's when the system was in its most efficient iteration. I hired Chris later (in 1974 iirc) and we showed him how to bend blades, add contrasting color to lug windows on painted frames, slot stays for dropouts, and other grunt tasks. He never did any serious brazing or effbuilding there. There was one or two other cats along the way, none of the cyclists who would have stayed in the game once the dust settled.